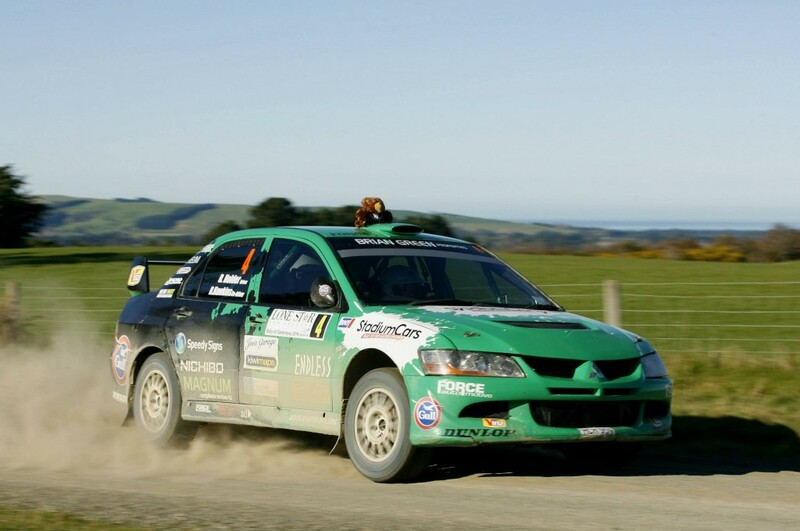 Tauranga driver David Holder was the sensation of the 2014 NZRC. Making his debut in the outright 4WD category, David stunned his rivals with his immediate pace at the opening round in Whangarei, taking the lead of the event on the first day. 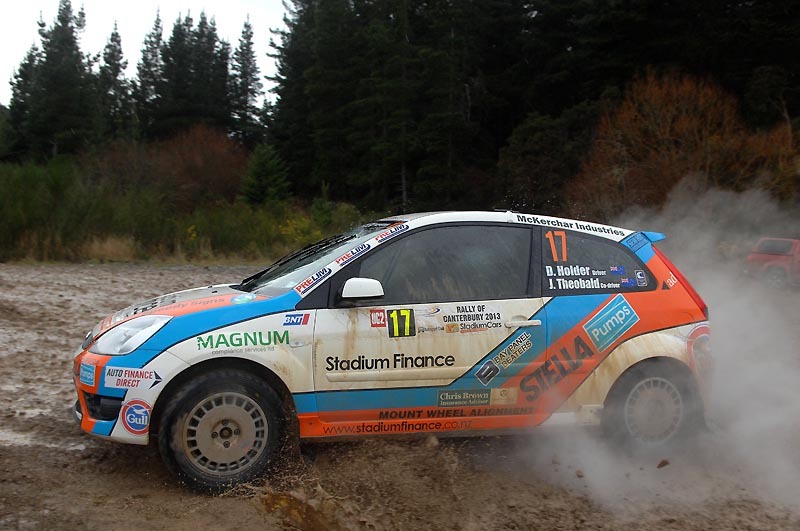 Five podium finishes from six rounds, netted third in the championship and the NZ Junior Rally Champion title. Ahead of the 2015 season we caught up with the driver of the Stadium Cars Mitsubishi Lancer Evo on his achievements to date and his plans for the future. NZRC: What has David Holder been up to over the summer months? DH: Busy is probably the word I would use to describe my summer off season. Straight after DayBreaker finished I sat down with Hayden Paddon (WRC driver and David’s mentor) to discuss what was the next best step for me, basically in short the conclusion we came to was that I really needed to dive in head first and commit to rallying fully if I was going to have a shot at following in his footsteps to the WRC. From there I took a couple of weeks to mull things over before any I made any decisions, but effectively I was faced with having too much to do and not enough time meaning it resulted in both my job as an Engineer and my dream to have a career as a professional rally driver both suffered, the only answer was to chose one or the other. Now committing to rallying full time obviously posed a few financial issues, luckily I managed to convince my wife that living off her was best for our future, honestly I still don’t know how I pulled that one off. So essentially it was decided I would finish work early February 2015 and focus on gathering sponsorship. Throughout all this we also found time to run a sponsors day to thank all of the business and people that helped make our season possible by taking them for a ‘hot seat ride.’ It’s one of my favourite things about rallying, getting the chance to take people who really have no idea how fast a car can go on gravel, strapping them in the passengers seat and turning down their intercom! You always get three types of people. The type that laugh away the whole ride loving every minute, the type that just sit quietly and don’t really say anything throughout the whole experience and the ones that swear at you the whole way round and have the shakes afterwards, these are my favourite type. Once that was over and the tough decisions had been made I pretty much spent all of November & December using my spare time at night’s and weekends doing proposals, getting on the phone and ringing people trying to drum up support. The next two months were a blur and now here I am in February, unemployed and living the dream as a professional rally driver who doesn’t get paid!. At the moment my days are filled with making cold calls to businesses for sponsorship, sometimes awkward ones. And working on getting the car prepared in the evenings, oh and I do the cooking now seeing I’m the stay at home husband, apparently that was in the agreement my wife says. For the 2014 season finale Daybreaker Rally you were joined by vastly experienced co-driver John Kennard, who we normally see with Hayden Paddon in the WRC. Looking back on that event, highlights for you of that opportunity? John was great. Don’t get me wrong it was really daunting having him in the car and was genuinely a really tough rally for me due to the fact there was a lot of weaknesses exposed, but at the end of the day I guess that’s the only way you can move forward and get better, so ultimately a really positive experience. I honestly didn’t know John very well at all before the rally, but there’s nothing like getting chucked in the deep end together. But he’s a very cool guy who has loads of amazing stories, pretty much any time we were touring between stages I was asking to hear some more about his experiences over the years. He’s got a fantastic sense of humor and I established pretty early on that he didn’t mind the odd fart in the car either (I’m a shocker on the startline haha!). The whole idea behind John getting in with me for the rally was obviously for him to pass on some wisdom, but also for Hayden to get some feedback on how I’m going as a driver/ where I need to work on things, safe to say we found plenty of area’s for improvement! A fantastic debut season in the 4WD class, with five podiums and 3rd overall in the championship. Does that change your approach heading into 2015? Thanks. Yeah it wasn’t without it’s challenges though. I guess we managed to have a dream debut in the 4WD class, well for one day at least, until I decided to have a closer inspection of the fencing techniques of farmers in Whangarei. The year’s focus was very much about learning, plenty of which was had. For me at time’s it was difficult because deep down I’m really competitive especially when it comes to rallying and although it’s a lot of fun, it’s always more fun to win. So while taking what I would probably describe as a more consistent approach to the season was great..and heck we were rewarded with some great results even if they were partially due to the misfortune of others, it’s just not quite as satisfying as giving it your absolute best on every corner! So for 2015 I would really like to take what we learnt last year regarding consistency, because obviously you still need to finish to win rallies, and apply a bit more outright pace to the mix. It’s going to be tough one though, especially when you take a look at the competition we’ve got in front of us. There’s a huge amount of talent in the championship at the moment, from the young gun’s like Ben Hunt, who has a great mix of being impressively consistent as well as fast, and then of course the experience and class that is Richard Mason. He provides a great yard stick as they say, someone that all of the young guys are vying to beat. Although we are a long way off his pace at the moment hopefully as the season progresses we can push closer and closer to snatching a rally win off him! Jason Farmer joins you as co-driver for the 2015 season, and has several years NZRC experience most recently with Matt Jansen and Alex Kelsey. How did that relationship come about? Awesome to have Jase on board! I actually approached him well over a year ago and asked about him coming on board with me, but at the time he was taking a year out from rallying to play a bit of soccer….he ended up breaking his leg in the first game and sat the rest of the year out though so maybe he should have stuck to rallying! Jase brings a huge amount of experience to the car being only 34 years old and having co-driven for 20yrs. I was really after someone with that kind of experience to be able to guide me/ keep me under control as in the great scheme of things I’m very much the ‘boy’ that has lots to learn in this sport at the moment. Jase is also a christian guy like myself which is an important part of rallying for us….after all the big fulla hooked us up with these talents so that’s the key foundation to our success. He’s also totally committed to what we want to achieve this year, to the point where he came across to Tauranga recently and spent two days with me ringing sponsors and putting proposals together, he’s been doing a lot of work in the back round to get our campaign ready. I’m not sure about other co-drivers but I haven’t heard of many that are willing input into that side of what we do, he summed it up the other day by saying ‘we are a team’ so we will be approaching the year together. Any major changes to the car for 2015? We are just getting into that side of things at the moment. I’m stoked to say that thanks to Stadium Cars we will be out there again in the Ex Hayden Paddon Evo8. Essentially first on the agenda is to pull everything apart and check/ rebuild things, diffs, gearbox & engine, Force Automotive will be taking care of that technical stuff. It will include throwing in some forged pistons for peace of mind into what will effectively become an Evo9 motor in an Evo8 shell, thanks to the new addition of a Mivec Evo9 head, again thanks to Stadium Cars. We won’t be going for a wound up motor with big power, but will be wanting a bit more torque down low to help us out, once we get it on the dyno we will post some power figures for those who are interested. The plan for the year is to have an open book policy when it comes to the car development so the public can check out how we do things and why, everyone is usually so secretive about these things in motorsport, hopefully other teams will do the same. Objectives for the 2015 season? Winning a championship is clearly our results based goal, although it’s a tough one with the caliber of our competition and the point’s now meaning something as small as a puncture during the year could decide the championship results. On the plus side depending on reliability of cars I think there could be a number of different faces standing on the podium throughout the year which is great for the sport. Looking past the New Zealand championship I really want to get things moving in the direction of heading overseas for an event or events, obviously this comes down to money otherwise I think you’ll find everyone would do it. It’s also all good me giving up my job to compete in the NZ championship but ultimately that step was taken so I can progress with getting to the WRC. Whangarei without a doubt! No particular stages for me really, but I just love the nature of the roads up there. My only wish is that more South Island competitors would make the long drive up to it, because I can assure you it’s worth it. That said my track record of finishes has been less than ideal at Whangarei having not finished a full event yet I’ve got a score to settle. Yourself, Ben Hunt and Phil Campbell have all progressed from front wheel drive cars to 4WD and been competitive immediately. What do you think it is that the 2WD experience provides? It’s a hard one because that formula is the only one I’ve tried so I can’t comment on the others! But I think ultimately as many will tell you, that driving an under powered FWD car will teach you the importance and skill of maximising your corner speed, then all you do is get in a 4WD car with more power and go faster on the straights. I thought it was going to be scary getting in something with some power and four wheels pushing you along, but the truth is you don’t actually notice the difference between charging along in a mighty Toyota Levin to challenging for podiums at rallies in a Mitsubishi Evo 8. When it comes down to it the corner speeds aren’t that different and things are somewhat proportional, yes the Evo goes faster, but it also has better brakes and suspension so you don’t notice the decrease in your stage times. Although my belief is that if you’ve got some natural ability in a rally car then you will make it to the top no matter which way you approach the sport, as long as you are out there driving, but my definite suggestion is that you take the FWD channel preferably Toyota.